On October 23, 2015, the US FDA approved Onivyde (Irinotecan liposome injection) in combination with fluorouracil and folinic acid for the treatment of patients with advanced metastatic pancreatic cancer who had previously received gemcitabine chemotherapy. According to estimates by the National Cancer Institute, the number of newly diagnosed pancreatic cancer patients in the United States will reach 48,960 in 2015, and 40,560 deaths from pancreatic cancer. Early diagnosis of pancreatic cancer is difficult and treatment options are limited, especially for patients with pancreatic cancer who have metastasized to other parts of the body (metastatic). The FDA grants Onivyde a priority review and orphan drug qualification. Priority review is the granting of new drug applications that, once approved, can significantly improve the safety and efficacy of treatments for serious illnesses. The orphan drug qualification certification supports and encourages the development of rare disease treatment drugs through incentives such as tax credits, consumer fee exemptions, and market exclusivity. The effectiveness of Onivyde was confirmed in a three-arm, randomized, open-label study. The study included 417 patients with metastatic pancreatic cancer who had received gemcitabine or gemcitabine-based chemotherapy but were not controlled to compare whether patients with Onivyde+fluorouracil/leucovorin or Onivyde treatment had greater survival than patients treated with fluorouracil/leucovorin. The mean survival of patients treated with Onivyde + fluorouracil/leucovorin was 6.1 months, compared with 4.2 months for patients treated with fluorouracil/leucovorin. Compared with patients treated with fluorouracil/leucovorin, the survival of patients treated with Onivyde alone did not improve. In addition, onivyde + fluorouracil / leucovorin treatment patients with delayed tumor growth time, the tumor growth start time of these patients was 3.1 months, and fluorouracil / leucovorin treatment patients for 1.5 months. The safety of Onivyde was evaluated in 398 patients treated with Onivyde+fluorouracil/leucovorin, Onivyde monotherapy or fluorouracil/leucovorin. The most common side effects of Onivyde treatment include diarrhea, fatigue, vomiting, nausea, loss of appetite, oral infections (stomatitis), and fever. Onivyde treatment can also lead to a decline in anti-infective cells (lymphopenia and neutropenia), as well as deaths from sepsis caused by neutropenia in patients treated with Onivyde. The Onivyde instructions contain a black box warning about the risk of severe neutropenia and diarrhoea. Onivyde is not approved for the treatment of patients with metastatic pancreatic cancer alone. 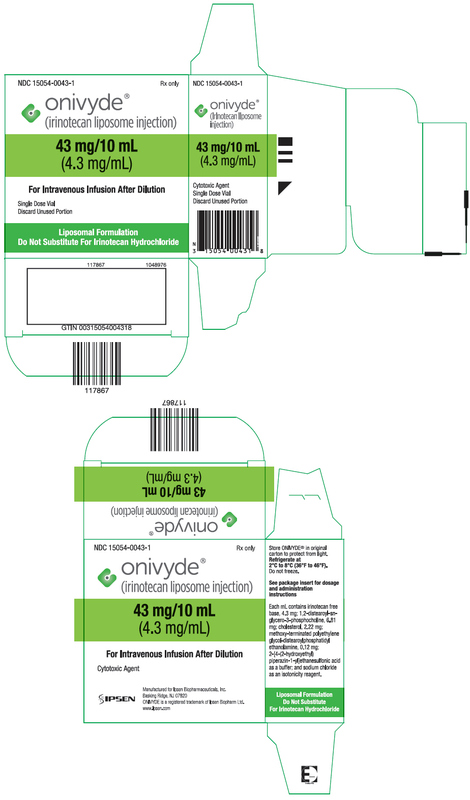 (1) The recommended dose for ONIVYDE is an intravenous infusion of 70 mg/m2 every two weeks for 90 minutes. (2) The recommended starting dose of ONIVYDE in UGT1A1*28 homozygous patients is 50 mg/m2 every two weeks. (3) There is no recommended dose of ONIVYDE for patients with serum bilirubin above the upper limit of normal. (4) Take corticosteroids and antiemetics 30 minutes before taking ONIVYDE. [Approved information at home and abroad] Merrimack Pharmaceuticals (formerly HERMES Biosciences) authorized Shire to develop and launch irinotecan lipid (MM-398) with PharmaEngine. Approved in Europe in May 2015 and approved for listing in the US in October 2015. Currently, irinotecan liposome injection is not listed in China. Features 1. The spontaneous formation of phospholipids in water, the preparation process is relatively simple; 2. It is non-toxic, non-immunogenic, degradable and slow-release in the human body; 3. It can enhance the stability and pharmacological action of the contained drug in the human body, release the drug after it reaches the target tissue stably, reduce the required dose and reduce the side effects; 4. Small single-chamber liposomes have passive targeting properties in the treatment of tumors, and can also be made into immunoliposomes to achieve active targeting; 5. Due to the hydrophilic and lipophilic properties of liposomes, they can carry lipids. The soluble drug reaches the target tissue through the blood circulation, making up for the defects that some important fat-soluble drugs are insoluble in water; 6. The FDA granted a priority review of irinotecan liposomal injections and orphan drug qualifications during the review.